If your dog bites someone, you will probably find yourself worried and upset. Will there be legal ramifications? Could your dog be euthanized or taken away from you? After a dog bite occurs, your first reaction might be shock or panic. However, it is important to take swift action if a dog bite occurs. Dog bites can also be prevented, especially if you know why they might bite. 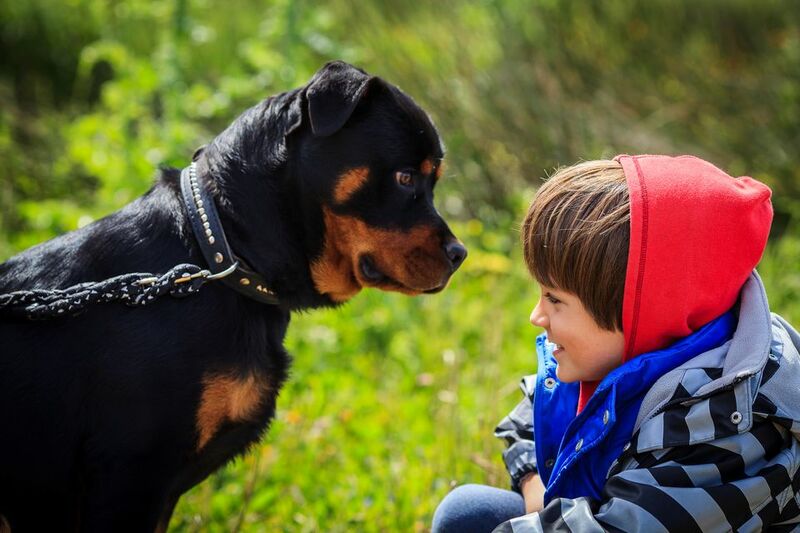 All children and adults should learn how to keep themselves safe around dogs. Most importantly, dog owners must be responsible for their dogs. Fortunately, responsible dog ownership and education of the public can keep everyone safe. Most often dogs bite people when they feel threatened in some way. It's a natural instinct that is still present in domesticated dogs, no matter how nice they are. That is why it's important for everyone who interacts with dogs to understand what may provoke this aggressive behavior. Dogs may bite in defense of themselves, their territory, or a member of their pack. Mother dogs will fiercely protect their puppies as well. Startling a dog, such as waking one up or a child suddenly approaching from behind, can provoke a dog bite. Running away from a dog, even if it's during play, can provoke it to bite. They may think it's part of the fun at first, but even that can turn to aggression quickly. Dogs who are in a fearful situation may bite whoever approaches them. This may be something as severe as being abused or abandoned, or it may be something you perceive as ordinary, such as a loud noise. Injury and illness are a common reason as well. If a dog is not feeling well, they may not even want to be approached or touched by their favorite people. At the very least, put your dog through basic training. Continue a training program throughout your dog's life to reinforce the lessons you've taught them. Socialize your dog. Allow your dog to meet and interact with different types of people under calm and positive circumstances, including children, disabled persons, and elderly people. Expose your dog to various situations on a regular basis, such as other animals, loud noises, large machines, bicycles, and anything else that might cause fear. Start at the youngest age possible and keep the experiences positive. Learn your dog's body language, as well as key signs that may lead to a bite. When you're around people, pay attention to your dog and know when aggression is building up. Stop it or remove your dog from the situation before it escalates. Do not discipline your dog with physical, violent, or aggressive punishments. Opt for positive reinforcement before resorting to the use of aversives. Remember to reward your dog for good behavior. Always keep your dog on a leash or in a fenced area. Know your dog well before letting it off-leash in permitted areas. Keep your dog in your sight at all times. If you suspect or know that your dog has fearful or aggressive tendencies, always warn others. Do not let your dog approach people and other animals unless the situation is highly controlled. Use a muzzle if necessary. Keep your dog's vaccinations current (especially rabies) and visit your vet routinely for wellness check-ups. Dogs are cute and often friendly, so it's easy to get excited when you see one. However, they can quickly turn on someone they don't know. Even if you don't have a dog yourself, it's important to know proper behavior for interacting with dogs and how and when to approach one. Teach these things to children as well so everyone knows what to do to prevent dog bites. Never try to approach or touch an unfamiliar dog without first asking for the owner's permission. If an owner is not present, do not go near the dog. When meeting an unknown dog, allow the dog to come to you. Crouch down or turn to the side. Let it sniff your hand before you pet it. Do not put your face close to an unknown dog; this includes "hugs and kisses." Understand dog body language. Most dogs will show specific warning signs before biting. If you are cornered by a dog, remain still and avoid eye contact. Never run or scream. When the dog stops paying attention to you, slowly back away. If you're knocked over by a dog, fall to your side in a fetal position, covering your head and face. Remain very still and calm. Never approach a dog that is eating, sleeping, or caring for puppies. Dogs in these situations are more likely to be protective and can become startled. Do not approach, touch, or attempt to move an injured dog. Instead, contact a veterinary professional or animal control for assistance. Be courteous and sympathetic to the bite victim. Avoid laying blame or getting defensive. This does not mean you need to admit fault. Remember that what you say may be used against you later if a legal or civil action is taken. Contact a medical professional for the bite victim. Depending on the severity of the bite, an ambulance may be needed. No matter how minor the bite is, the victim should seek medical care. Dog bites that look mild on the surface can get serious very fast. Contact your veterinarian and obtain your dog's medical records. You will need to show proof of your dog's rabies vaccination history. Depending on the situation and your dog's history, it is possible for your dog to be designated a "dangerous dog." You may have to comply with specific laws regarding the handling of your dog. Laws may require that your dog is euthanized if your dog is considered "dangerous," if the injury was very serious, or if a fatality occurred. Also, you could be held legally responsible and face criminal charges. The dog bite victim may choose to press charges or file a civil suit against you. In either case, you should immediately hire an attorney. While you may or may not be legally ordered to cover the victim's medical expenses, it is a good idea to offer up front to pay. This shows the victim that you are accepting responsibility for your dog. It may even help you avoid a messy lawsuit. Above all, it is the ethical thing to do, even if you have an explanation for the dog bite. In reality, proving your dog was provoked or somehow justified will be difficult unless it can be proven that the victim was committing a crime. This simply may not be an argument that is not worth having. If you are fortunate enough to get to keep your dog, it is your responsibility to prevent this type of thing from happening in the future. Take steps to prevent your dog from biting again. In most cases, a dog bite can be easily prevented by taking the proper safety measures. If you are able to determine what triggered the bite, try to keep your dog from getting into the same situation. Work with your dog to adjust its reaction to the trigger. It is absolutely essential to work on training and socialization with your dog as soon as possible after the bite. The best plan is to contact a professional trainer and possibly a veterinary behaviorist. Many dogs with aggression can be helped through training, socialization, and behavior modification. Sadly, in some cases of major aggression that cannot be reversed, the most humane thing to do is euthanasia. Of course, this is the last resort.